Years ago, Richard Quick, a legendary coach, confided to me that in spite of all the Olympic medals his athletes won, he still remembers a few who had similar talent but never reached the top. According to coach Quick, that happened simply because he just didn’t have the proper tools he needed to address their weaknesses. Richard honestly thought that it was his personal fault, since he failed to help them achieve the success they deserved. Ruined hopes, unrealized potential, shattered dreams… I saw tears in Richard’s eyes when he told me that. Coming from such a legendary coach, this confession was both shocking and sobering. As a national level coach, Richard had access to every possible resource in the country. Despite that he still was not able to find the proper way to reach every athlete he coached. So how can we expect coaches with limited means to do any better? Although a number of books and publications have recently come out on the subject of training methodology, most merely have rehashed views and philosophies of sports training that have dominated sports science since the 60’s. And the typical clinics that abound for coaches are not much better. Most consist of little else than glib stories and opinions of winning coaches, making no attempt to analyze their experiences or explain the underlying reasons for their success. It is not surprising then that only a few useful tools are available to coaches today. That is an unfortunate situation because there is no doubt that training methodology in general, and reliable training design tools in particular, can enable us to help our athletes achieve peak performance. Using these methods and tools properly can also spell the difference between mediocre and outstanding results in athletes of similar talent. To understand how we can do this, however, we must first review the foundational principles of our current planning techniques, and then explore alternative theories and training methods that can benefit all coaches and their athletes. Without a doubt modern training techniques have all been built on the foundational principles laid out in “Periodization” theory that was first introduced by the Soviet scientist Lev Matveev in the early 1960’s. Matveev also suggested that “theory of sports training” should be a separate area of sports science (I take my hat off to him just for that). His seminal research led to the conception and development of classic Periodization Theory, which attempted to explain the variability in performance of elite athletes during their annual and semi-annual seasons. Using statistical models, “waves of peak performance acquisition” (or distribution of individual results) during a season were introduced. 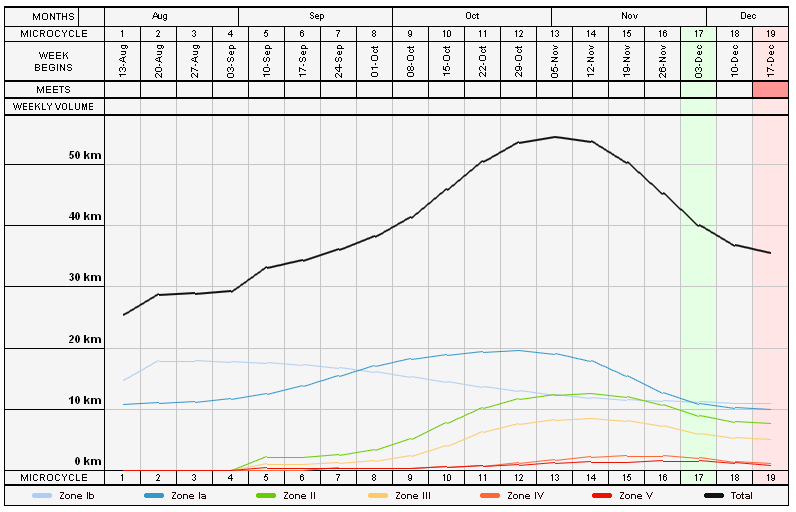 Training cycles and phases were added in an attempt to support the variability of results during the season. These same cycles (micro, mezzo, and macro) were offered as “tools” to help plan and manage the season. By the mid-70’s Matveev’s approach had become a worldwide standard, largely through the efforts of Tudor Bompa, who popularized the concept from Canada. Considering the historic period when this research occurred, it is important to understand that the calendar sports events followed then was nearly always dictated by seasonal and climatic changes. This is quite different from the way things are today. We have many more competitions now with ever-shorter times between them. Events are also held now in heated or cooled facilities, and some sports, like swimming, have completely reversed their season, changing the very criteria that formed the base of periodization theory. There is no doubt that the wave-like performance acquisition model was quite progressive for its time. However, it seemed to indicate to coachesthat the training patterns necessary to support the progression they desired were uniform, and that they were directly proportional to training volume.So training volume alone then became the main training/planning parameter that was manipulated in an effort to achieve peak performance. This kind of “volume-based” coaching philosophy dominated training methodology for a good twenty years, and can be found among some elite coaches even today. In practical terms applying volume-based training required scientists and coaches to determine and justify a mix of training volumes in different training cycles. Different methods for calculating required training volumes were suggested all the way down to a micro cycle. However, the final distribution of training work on a weekly and daily basis was left to the coach. This situation led to the creation of “coaching systems”, where different combinations of training volumes were considered a coach’s or even a nation’s secret. A huge gap then developed between sports science and practical coaching, which created a sense of mystique around the coaching profession and the skills required to become a winning coach. Victories and medals become the sole measure of individual coaching success, but tragically that left thousands of athletes in its wake. Shattered careers, due to chronic overtraining, were justified and accepted as necessary payment for a coach’s (or even a nation’s) success and personal glory. Today coaches still continue to manipulate micro, mezzo and macro cycles in an effort to balance training loads so they can reach maximum performance when they want it. Virtually every coach believes that classic periodization principles will help him accomplish this task, even if he doesn’t exactly understand why. However, classic periodization has known flaws. Also, other, much more effective alternatives to periodization criteria were developed and exist today. We believe when applied they can raise the quality of planning and management of the training process. Advances in the theory of sports training are driven by efforts to compete at an elite level, and from research in the health industry. And although our views and knowledge about exercise physiology have made dramatic progress in the last 15-20 years, we still allow classic periodization theory to actually dictate the very way in which we plan our seasons and distribute weekly training loads for our athletes. As coaches we need to know “Is periodization infallible?” and “Will it meet the needs of today’s athletes?” To answer these questions we need take a closer look at periodization and discuss modern views and alternatives to it. From its inception classic periodization was criticized for its lack of clarity on key issues related both to the direction and content of training work during suggested cycles, as well as its inability to quantify those parameters. And the results of studies devoted to understanding human adaptation to physical exercise and training did not fully support Matveev’s “classic” periodization either. It was clear already at that time that in order to better control the training process and the development of specific abilities in athletes individual adaptation drivers needed to be better defined and properly positioned in time… something classic periodization failed to address. Essentially, two main issues needed to be resolved. · When should specific training loads be introduced to achieve desired (optimum) progression? · How much load at what intensity should be introduced to produce the desired changes over time? Researchers had been trying to find answers to these questions since the early 70’s, and actually achieved significant progress in that endeavor from both a training methodology and an exercise physiology perspective. Their studies also helped explain some key questions concerning individual physiological reactions to specific exercise and their effective application over time (training strategy). Those results led to the concept of “training design”, a concept that only became possible when specific training parameters had been clearly defined and the tools to measure them had been developed. Recent research also suggests that continuous, non-interrupted, specific adaptation can replace classic periodization criteria, and serve as a foundation for training planning and management tasks as well. This is possible since we can both measure and control adaptation progression by selecting proper stressors appropriately positioned in time. This is infinitely more effective than the waves of change of elite performance suggested by classic periodization theory. To see what this means in practical terms consider this typical season plan that is based on classic periodization theory. 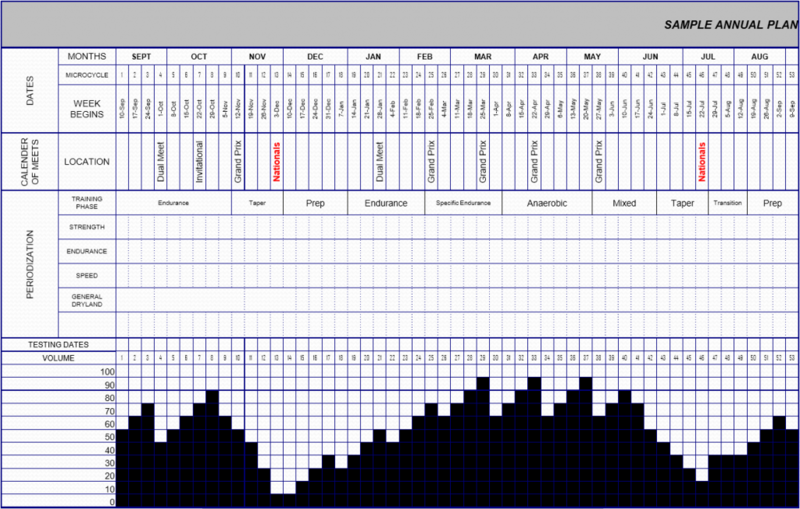 This type of season plan is based on distributing the total training load throughout the season in groups of mezzo cycles and also includes recovery (micro) cycles to allow adaptation to catch up with the suggested (and quite demanding) training load. The main characteristic of the training load in this case is sheer volume (time of work, meters, yards, kilograms, etc.). This approach to season planning concentrates on the duration and direction of each mezzo cycle, with recovery cycles (“easy” loads) included to reduce the possibility of overtraining. Unfortunately, there are several major problems with this method. To begin with it is difficult, if not completely impossible, to create a proper “training mix” between required training intensity and volume on a weekly or even at mezzo cycle levels. Another major problem lies in the timing of when to introduce high intensity training. Chart 2. Optimal Adaptation Progression (presented as optimum change of maximum speed/power output on ergometer (Yellow curve) in relation to total training volume in the season. Blue “squares” indicate actual results obtained through a formalized weekly tests. Source: Super Sport Systems Tools (Collaged). Once we establish the progression of adaptation to required speed throughout the season, we can then start to plan specific training factors that can help us achieve the goals we want and keep individual adaptation (or the ability to achieve and keep desired paces) at the level of individual adaptation threshold. This provides optimum efficiency of training. The character of the maximum result on standard distance curve (yellow) reflects the typical pattern of adaptation to physical exercise and remains generally constant in character, if we want to exploit adaptive abilities to their limits. The range of change (beginning and goal speed or result) in this case can be calibrated. Additionally, overall progression and its rate can be planned and programmed as well, understanding that in most cases progression will depend on previous training history and individual ability to improve (among other factors). The season volume in our case is yet another calculated (not guessed!) parameter. correlated with goal result. This approach opens unlimited opportunities when it comes to intelligent management of the training process. The development of different energy producing mechanisms doesn’t occur at the same time during the season. Chart 3. 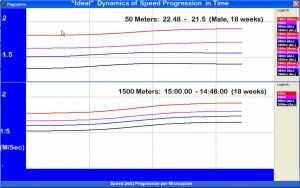 Dynamic of maximum speeds on different distances (in relation to 100 yard event). Source: 3S “EXPERT” Program. It should be noted that the rate of speed progression in a season should be different for different durations of maximum effort (different events), since the energy supply mechanisms in this cases are also different. Understanding this concept opens the door to selecting very precise season training strategies, especially if we possess enough knowledge about maximizing techniques for each separate function that we are trying to address and their interdependence on each other. The main difference with this way of thinking, compared to the traditional approach, is in the fact that we must first understand and quantify the necessary adaptation boundaries, and only then proceed with the design of a training regimen that will help us develop and maintain target functions and abilities. Knowing how to do this will give us the ability to create well balanced and very focused training plans, where every training effort can be quantified and positioned in time. Training design in this case is focused on finding the most effective training strategies that can compliment (or compensate for) an individual athlete’s abilities. Doing this creates a season plan that addresses all individual peculiarities of an athlete’s development, and also accommodates for calendar needs as well. Compare this plan with the earlier one based on classic periodization and you will immediately see what is now possible. Training plans built on a training design foundation are actually constructed from the sums of “partial training volumes” (training volumes in each energy zone). The zones of intensity in this case are connected with individual physiological abilities and target goals, completing the planning circle. Unlike its ancestor, this new approach to periodization opens the ability to manipulate training loads within seasons by changing the percentage of training volume in each intensity level, their individual progression, and their exact positioning in time. This enables a coach to plan his expected results and manage preparation with much greater precision and predictability. And that’s where “training design”, the logical successor to classical periodization theory, has stepped in to proclaim its importance. And of course, you can always rely on our expertise and pre-set strategies that are proven to produce champions! Coaches usually learn how to distribute training loads and intensity through trial and error. Because of the lack of studies and publications in this field many novice coaches have chosen to jump on the bandwagon of untested or outdated theories. This often leaves them stumbling around in the dark for the first decade or so of their career. But this delay is no longer necessary, since this “trial by fire” period of their career can be shortened considerably with the use of training design tools and an understanding of their principles. Clearly there are many other advantages as well. By using “training design” principles and the new tools that come with them, all coaches can now easily and intelligently manage their training process. The cloud of mystery surrounding training design is also gone. Instead we can now receive clear and precise solutions for every athlete and situation. This approach opens up unlimited creative possibilities with an unparalleled attention to even the most minute detail of the training process for every coach who dares to make a change and wants to learn new training ideas. We simply don’t know of a better way or an alternative set of tools that will give you the precision and control you need today to compete at any level and realize the full potential of every athlete you train. So… the choice is yours. And it’s really a rather simple one. Move on, or get left behind.